Continue to check back as we are still adding things. This message will disappear when things are finalized for this event. Bring the entire family out for a day in horse country. We will have live music by the very talented, Buckin’ Wild Band and other local artists, delicious food provided by local vendors such as Carrie’s Catering, Nawty Hogg BBQ, and Mr. Ed’s Ice Cream. Featured groups like the Whispering Pines Clydesdales, Calendar Girls Florida, UpBeat K-9 Mobile Dog Training Co., and others will be giving demonstrations. Multiple vendors will be onsite with an assortment of items for purchase. Raffle prizes, 50/50 drawing, games for the kids, hay rides for the family, tours of our wonderful facility, Bake Sale, Tack Sale and much much more. This event is FREE and open to the public. Other fees may apply. More Sponsors are to come… We are still accepting sponsors. Notify us if you are interested. It was April 15th, 2014 that SWFHR (founded 2010) was able to purchase a property, in order to develop an equine rescue facility. All of which was made possible by a grant from a private foundation. The owners Tina, Matt and a host of dedicated volunteers over the years have been developing the facility that you will see. The horses always come first is our motto. Most do not know the vast cost of running an organization of this size, nor do they truly know how we fund our daily operations. Read more about us, to truly know more about us. This event is primarily to celebrate the 4th year of operation here at the new SWFHR Facility. We hope to see our local community and their families enjoy this event and leave with a smile on their face, a bit of knowledge behind what we do, and who we are. Maybe even a prize or two from our auctions and raffles. Bring the family and out for a day in horse country! Proceeds from this event will go to the continued construction of our wonderful Rescue facility, to make this a safe and healthy environment for all of our rescued equines. Read more on our Facebook event page here and tell your friends! What will you see at the benefit? Meet & Greet the rescued equines at the facility. 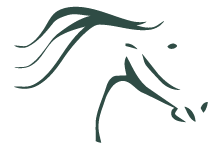 Meet the horses in their living environments and be given a brief synopsis of their story by SWFHR Event Volunteers. Greet the working staff of SWFHR to put a face to the people behind the scenes at South West Florida Horse Rescue. 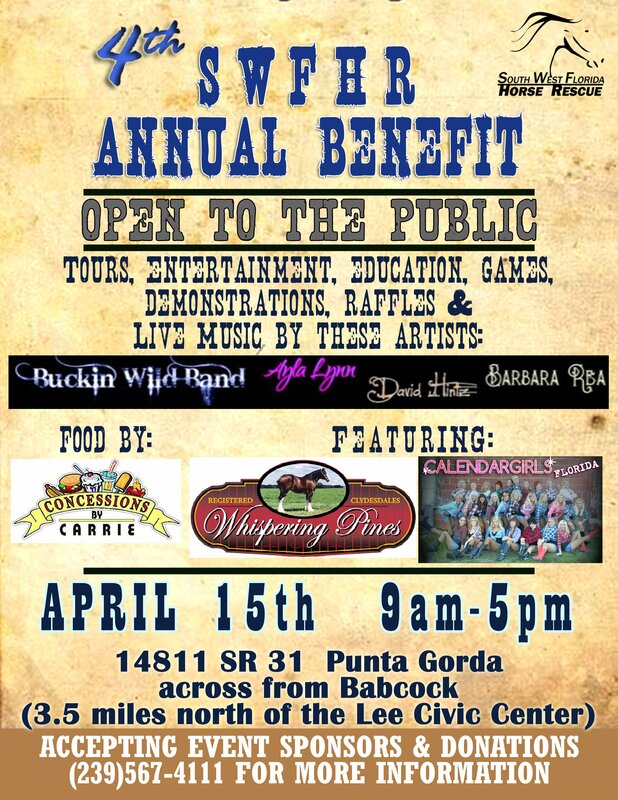 Music sponsored by these artists: Buckin’ Wild Band, Ayla Lynn, David Hintz and Barb Rea. Demonstrations featuring a number of educational and entertaining shows headlined by the Whispering Pines Clydesdales from 10am-12pm, the Calendar Girls Florida from 1pm-2pm, and UpBeat K-9 Mobile Dog Training Co. demonstrations just to mention a few. Games for both adult and children. Food Vendors from Philly Cheese Steaks or Pulled Pork to Ice Cream or Shaved Ice our food vendors got you covered. Highlighted vendors are Carrie’s Vending, Nawty Hogg, and Mr. Ed’s Ice Cream. Merchandise Vendors everyone loves interesting things and our vendors will bring it. Highlighted vendors are Healthy Harvest Community Farms, FarmHouse It Up, Whisk Me Away, and more to come. New Vendors may add all the way until the day before the Benefit. What fees will there be at the benefit? This event is “Open to the Public” meaning there is no entry fee. Donations, however, are much appreciated. Music, Entertainment / Demonstrations, and Touring the facility are free. What specifics, do I need to know about the benefit? A COPY OF THE OFFICIAL REGISTRATION AND FINANCIAL INFORMATION MAY BE OBTAINED FROM THE DIVISION OF CONSUMER SERVICES BY CALLING TOLL-FREE 1-800-HELP-FLA (435-7352) WITHIN THE STATE. REGISTRATION DOES NOT IMPLY ENDORSEMENT, APPROVAL, OR RECOMMENDATION BY THE STATE. - (REG#CH40783) VISIT WWW.FLORIDACONSUMERHELP.COM FOR REGISTRATION INFORMATION. (SWFHR) is a Florida not for profit corporation created pursuant to Section 501(c)(3) of the Internal Revenue Code. This means that donors can contribute sums to the organization and deduct those contributions from their income taxes.